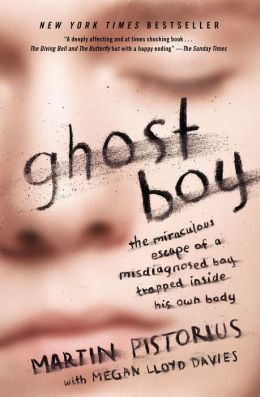 Martin Pistorius tells his story in short chapters, from childhood in Johannesburg, South Africa, through his marriage in the UK, in 2008. The title comes from his 14 year ordeal, after succumbing to an unknown neuromuscular disorder at age 12 which trapped his body in a wheelchair and rendered him silent. As mysteriously as it appeared, in his mid-twenties, the blanket of his illness began to recede, and with the limited movement of face, head and one hand, he began to communicate with the world via computer. With great determination he educated himself to utilize technology, to the point where he now has a career in adaptive computer technology and helping others like him learn to communicate, despite their physical limitations. His unwavering faith, heroic perseverance and keen intelligence give him a unique perspective on life and living in a harsh world who had written him off as irretrievably damaged. This book is a good choice for any who are dealing with the effects of chronic limitations, physical, psychological or spiritual. Written with wit, understanding and a marked lack of self-pity, the reader is left with the clean tang of insight and encouragement. With a refreshing voice, Pistorius speaks to those who are struggling with loneliness and seemingly insurmountable problems. He presents a solid picture of trust when he talks of the Lord standing by him. While the world repeatedly tries to grind his dreams into dust, Pistorius’ faith helps guide his vision into the light, as the Lord intends for all of us. Elizabeth Tenney is a long time public library worker and lover of reading.